Posted on January 25, 2019 at 9:35 am. 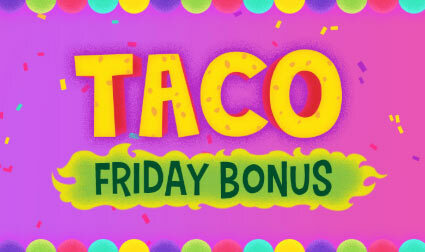 Real money players at Mucho Vegas Casino can venture into flavour country with the Taco Friday Bonus. Log on, opt in and deposit $25 or more any time on Friday to unlock a 30 per cent match up to $300. If you deposit $100, for example, you get another $30 bonus cash on the house. – The bonus and deposit amounts are subject to a 30x rollover before a withdrawal can be initiated. – Player can receive only match bonus per week in the context of this promotion. – This offer cannot be combined with any other, including other match bonuses or other promotional offering. – To receive the bonus, please select the bonus when making your deposit. The match bonus will not be credited to players who did not select the bonus during the deposit. The minimum deposit to qualify for the offer is €/$25 (250 SEK/NOK/ZAR). Find out more at MuchoVegasCasino.com, where new players can score up to $1500 bonus cash and 150 free spins.